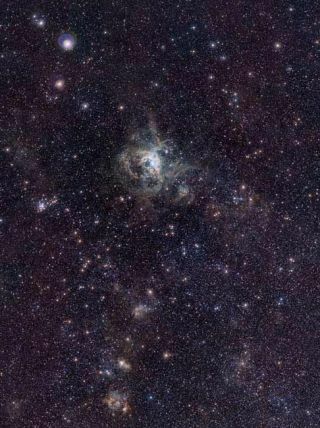 This VISTA image shows the spectacular 30 Doradus star-forming region, also called the Tarantula Nebula. At its core is a large cluster of stars known as R 136, in which some of the most massive stars known are located. This infrared image, made with ESO's VISTA survey telescope, is from the VISTA Magellanic Cloud Survey. Violetsparkles of baby stars lighten the dark field of the Tarantula Nebula,ayellow-tinged cloud of gas in a nearby galaxy, in a new photo releasedthisweek. "Thisview is of oneof the most important regions of star formation in the local universe ?thespectacular 30 Doradus star-forming region, also called the TarantulaNebula," said lead researcher Maria-Rosa Cioni of theUniversity ofHertfordshire in the U.K. "At its core is a large cluster of starscalledRMC 136, in which some of the most massive stars known are located." Most of theyoung stars in this region are cloaked by gas and dust wherethey were formed.But the near-infrared wavelengths that the VISTA telescope observes inarelonger than visible light, making them able to pierce theseobstructions andilluminate the fine details of nebula. By the endof the VISTA MagellanicCloud Survey, the telescope will have imaged 184 squaredegrees of the sky? equivalent to 1,000 times the area of the full moon as seen fromEarth. "TheVISTA images will allow us to extend our studies beyondthe inner regions of the Tarantula into the multitude of smallerstellarnurseries nearby, which also harbor a rich population of young andmassivestars," said researcher Chris Evans from the VISTA survey team. "Armedwith the new, exquisite infrared images, we will be able to probe thecocoonsin which massive stars are still forming today, while also looking attheirinteraction with older stars in the wider region." The newimage already shows a variety of star systems: Outside the TarantulaNebula inthe center, the NGC 2100 starcluster flanks it to the left while a remnant of supernovaSN1987A (eso1032)glows to the right. Star-formingregions below comprise NGC 2080 (known as the "Ghost Head Nebula"),and the NGC 2083 star cluster. Over thenext five years, VISTA will be used for five more near-infrared surveysof thesouthern sky, ESO officials said in a statement.